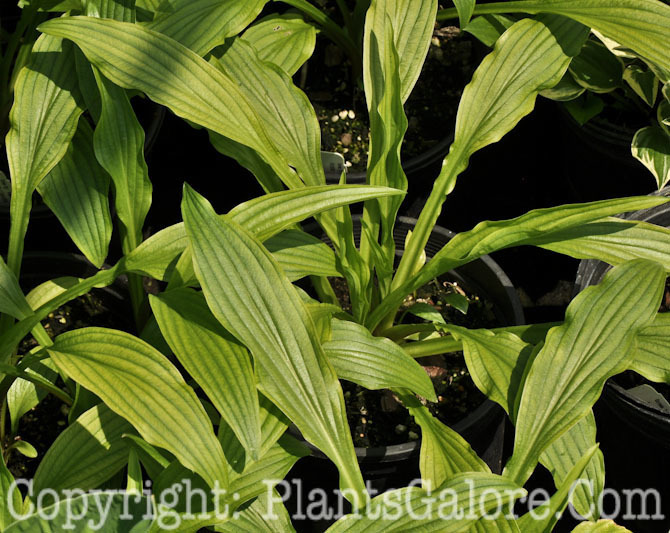 According to The Genus Hosta by W. George Schmid (1991), this species is called "the small size hosta" and "The epithet intermedia used in the synonyms for this taxon indicates its taxonomic position between H. sieboldii and H. rectifolia although it is much closer to the former. It is seldom seen in gardens." The Hostapedia by Mark Zilis (2009) describes this species as "...native to Honshu Island, Japan...11" high...wide mound of narrow, green foliage...slightly shiny on top, whitish shiny on the underside...purple flowers...from late August to mid-Septembers...a little known species, even to avid collectors...For many years a gold-leaved 'Subcrocea'-type plant was incorrectly grown under this name..."
Similar hostas include H. longissima and Hosta sieboldii forma spathulata. The species name was once used as the incorrect name for H. 'Kabitan'.